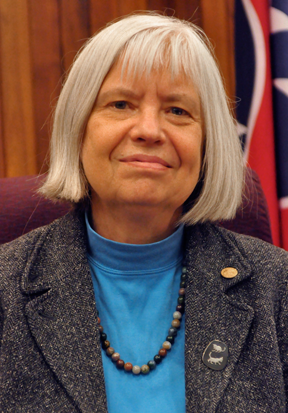 A native of Connecticut, Ellen Smith has lived in Oak Ridge since 1981. She is an environmental scientist on the staff of the Environmental Sciences Division at Oak Ridge National Laboratory, where she has participated in or managed a variety of activities related to waste management and environmental impact assessment. She was first elected to City Council in 2007. She served from 2007 to 2012 and was elected again for a 4-year term that began in 2014. As a Council member she served as Mayor Pro-Tem from 2014 to 2016, has served on the Council’s Budget and Finance Committee and other ad hoc committees, represented the Council on the City and Schools Preschool Planning Committee in 2015, and has represented city government in retail recruitment activities. She participated as a member of two technical committees for the Plan ET regional planning initiative (2011-2013) for the Knoxville region. In 2016 she became a member of the National League of Cities’ Energy, Environment and Natural Resources Advocacy Committee. Ellen served as an appointed member of the City's Environmental Quality Advisory Board (EQAB) from 1991 to 2007 and from 2013 to 2014. She was EQAB's vice-chairman for 5 years and chairman for 11 years. Ellen received a BA degree in 1974 from Carleton College in Minnesota, where her major was geology. In 1979 she obtained an MS degree in Water Resources Management from the University of Wisconsin-Madison, where she also completed most requirements for an MS in Geology. More recently she completed the Tennessee Municipal Technical Advisory Service (MTAS) Elected Officials Academy (levels 1 and 2). Trinity Out-Reach Center of Hope (TORCH), member of board of directors. Advocates for the Oak Ridge Reservation (AFORR). Charter member and vice-president. Keep Anderson County Beautiful, member of organizing team and member of board since the organization was established. League of Women Voters of Oak Ridge, member. Altrusa International of Oak Ridge, member. Member of Environmental Management (EM) and Stewardship Committee of the DOE Oak Ridge Site Specific Advisory Board (SSAB). Oak Ridge Reservation Local Oversight Committee (LOC). Member of board of directors for several years before organization ceased operation in 2011. Oak Ridge High School Stakeholders' Committee, 2003. Community Leadership Award, UT-Battelle Awards Night, 2001. Oak Ridge City Center Master Plan Steering Committee, 2001. Oak Ridge Reservation Stewardship Working Group. Participant and contributor to the Oak Ridge Reservation Stakeholder Report on Stewardship, Vol. 2. 1999. Save Our Cumberland Mountains (SOCM) strip-mining committee. Received "Friend of SOCM" Awards in 1988 and 1997. Oak Ridge Regional Planning Commission Karst Task Force, 1997. Cub Scout Pack 226 (Linden School), volunteer leader, 1996-1998. Lower East Fork Poplar Creek Citizens' Working Group, 1992-1994. Greenways Oak Ridge and the earlier Greenways Task Force (1992-1993). Association for Women in Science (AWIS) - East Tennessee Chapter. Charter member and former officer. Award for Service to AWIS-ETC, 1988. Ellen is married to Richard Norby, a senior researcher in the ORNL Environmental Sciences Division and a UT-Battelle corporate fellow. Ellen has a website at www.ellensmith.org.